Planners are always looking for the perfect event venue for their clients. If you currently find yourself searching for event spaces near me in Brooklyn for weddings and events, or even for graduation venues near me in Brooklyn, Alexandra Partow of Alexandra Partow Events shares this list of “secret Brooklyn addresses” which may provide you a Brooklyn event venue you hadn’t considered in the past! Gotham Market is an upscale 16,000 sq. ft. “food court” with gorgeous light fixtures from Urban glass and lots of light. Most recently, Partow held the pre-party for the Brooklyn Youth Chorus 25th-anniversary gala here for 300 guests before a BAM concert across the street. This Brooklyn event space offers 7 artisanal restaurants and bars with Brooklyn-local vendors, including Apizza, Boqueria, and Mason Jar. Kai Studio is a posh 6,000 sq. ft. venue with two lounges which is often perfect for club-theme mitzvahs. Long white velour curtains line the walls, and a beautiful bar complements the space lending an Asian flavor. The mezzanine can be used for kids’ games, for an adult dinner or as a lounge. 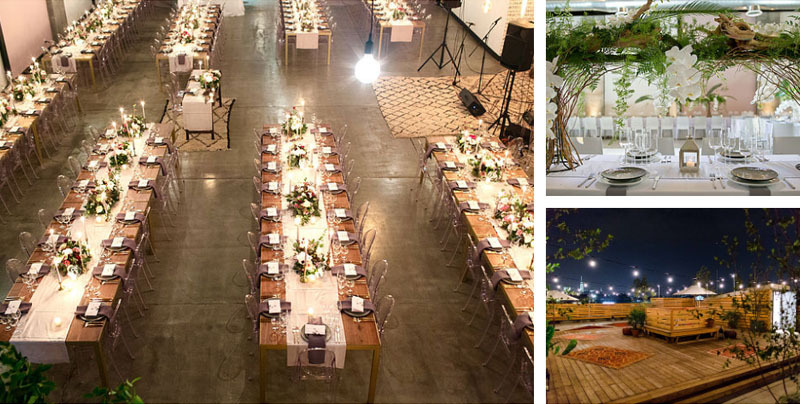 Dobbin St. is a tailored Brooklyn event space centrally located in Williamsburg that exudes a minimalist and luxury feel, boasting stunning Manhattan skyline views and vaulted 22-foot ceilings. The venue combines 8,900 sq. ft. of indoor and outdoor space. Clients have the use of 4,250 sq. ft. of internal space, and a 750 sq. ft. dedicated client mezzanine. A 900 sq. ft. courtyard is the beautiful hidden gem that completes the space. One flight up is a 3,000 sq. ft. terrace – an exquisite setting for a wedding ceremony or open- air event. Pig Beach is an award-winning 10,000 sq. ft. outdoor BBQ spot for hipster carnivores replete with string lights and wooden picnic furniture. The menu is an exciting new foray into the Smoked Meat Universe, unlike anything in New York City to date focusing on live wood fire. Pig Beach is also a destination for contemporary cocktails and wine. A new 5500 square foot indoor space is opening in July 2017 creating the perfect indoor/outdoor experience for a bohemian style wedding, party or brand activation. The Bogart Penthouse is one of the newer event spaces in Brooklyn located in an industrial area of Bushwick, Brooklyn. highlighted with colorful graffiti. The venue features a third-floor loft with 12-foot ceilings opening onto a charming outdoor patio with an urban feel. The dramatic fourth-floor roof deck boasts a fireplace and has elevator access. Both the loft and the rooftop have a standing capacity of about 300 people. Bogart Penthouse also has a powerful club sound system, LED dance floor and color uplighting. House DJ X-Ray can be hired for your event or you can bring your own. The Brooklyn Zoo occupies the first two floors — a sprawling, graffiti covered fitness space for parkour training, aerial arts, tumbling and trampoline. The venue is perfect for a wedding, party or mitzvah celebration. For an additional charge, kids can enjoy a couple of hours of sports activities with expert trainers at the Brooklyn Zoo while adults enjoy cocktails upstairs, reuniting for dinner and dancing in the loft. Additionally, here are four out-of-the box event spaces in Brooklyn located in various neighborhoods. Two double as theaters and two are restaurants. 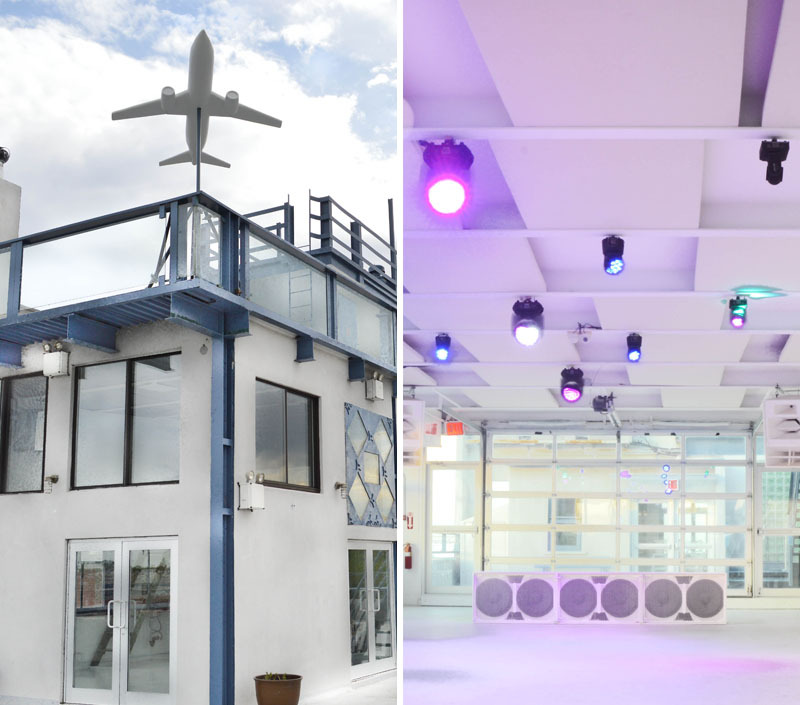 Each Brooklyn event space offers a creative vibe for that client who is looking for something unique. 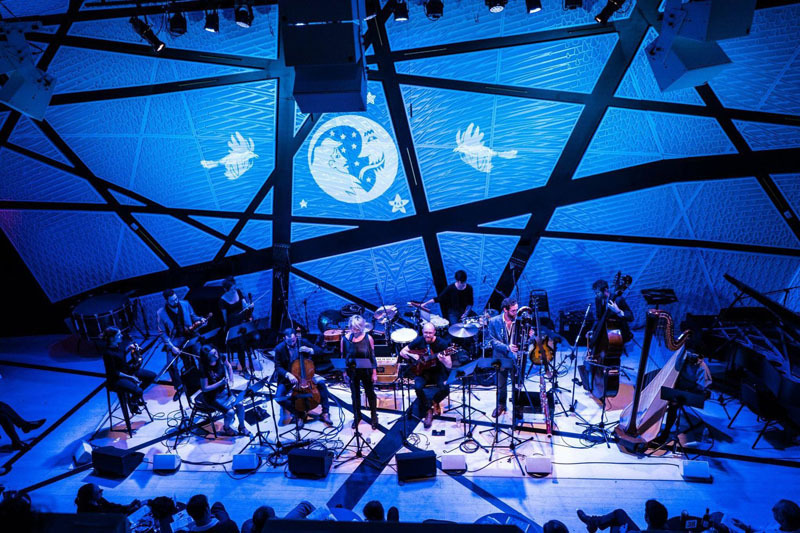 Located in Williamsburg, National Sawdust is an unparalleled Brooklyn event space and non-profit organization, housed and constructed within a preserved century-old sawdust factory. At its core is a flexible main hall, architecturally and acoustically designed to provide unmatched visual and auditory experiences. Uber-modern, the space has to be seen. There is nothing like it in NYC. 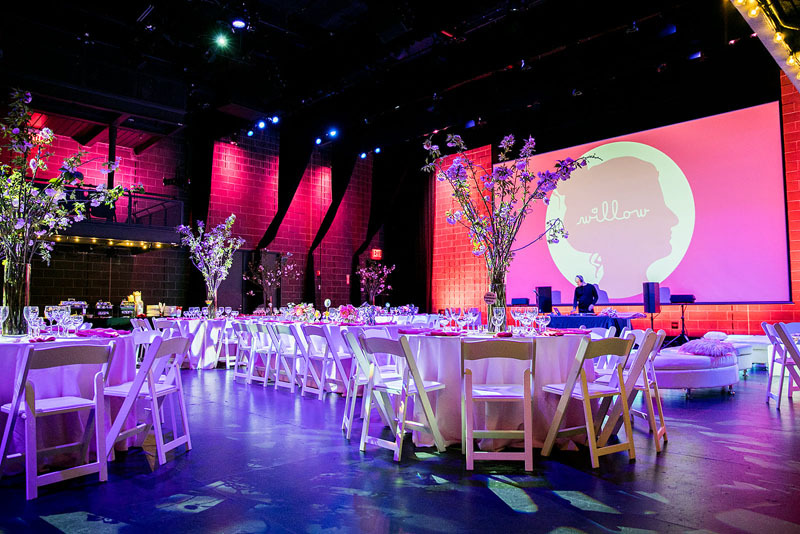 Couples who choose to host their wedding at National Sawdust will have an out–of–the–box experience. Unlike any other wedding venue, they provide state of the art lighting, staging, and sound as well as on-site technicians and a lighting designer in the venue rental. In-house catering is through the connected restaurant, Rider, a Michelin rated ‘Bib Gourmand’ restaurant that serves sophisticated modern cuisine. BRIC presents programs in contemporary art, performing arts, and video that reflects the creativity and diversity of Brooklyn. BRIC House offers versatile spaces in a contemporary setting with state-of-the-art AV technology. There are three areas throughout the event spaces to display impactful graphics or branding. The ballroom is also a black box theater fully loaded with projection and lighting capabilities. One of my favorite areas of BRIC House is called “The Stoop” where guests can gather for a presentation or toast while sitting on concrete “stairs” outfitted with comfortable cushions. I’ve planned a bat mitzvah where this area was used for havdallah service before heading into the ballroom for a fabulous dinner and dance party. Capacity for this Brooklyn event space is 250 theater style seating, 260 seated dinner, and 440 standing. Annabelle Selldorf Architects converted this former garage into a 9000 square foot restaurant for the founders of Brooklyn Flea & Smorgasburg. Five purveyors provide catering: Mighty Quinn’s BBQ, Landhaus, Jianbing Company and Pizza by Charlie. In addition to these creative catering options, Berg’n has one of the best beer lists in NYC, good wine and classic cocktails. The restaurant also offers a coffee bar and dessert station and a 15-foot projection screen. 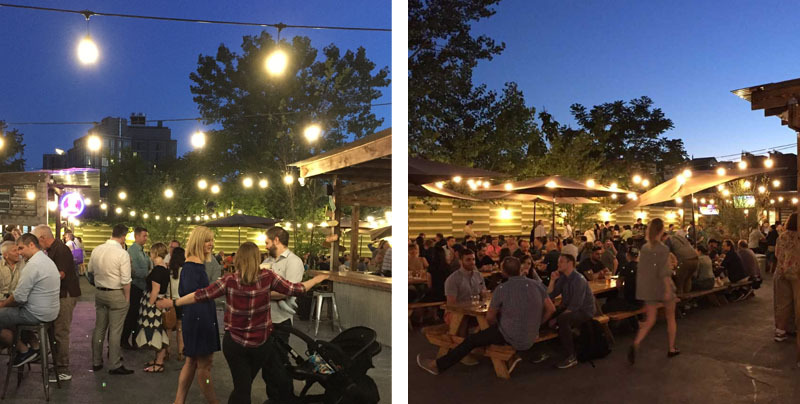 The entire space is available as a buy-out, including the main restaurant hall, which features a monolithic wooden bar, a private dining room and an outdoor garden. The event spaces in Brooklyn at this venue fit up to 350 people and 250 seated guests. Berg’n offers a minimalist vibe with industrial lighting, large windows and an indoor/outdoor experience. 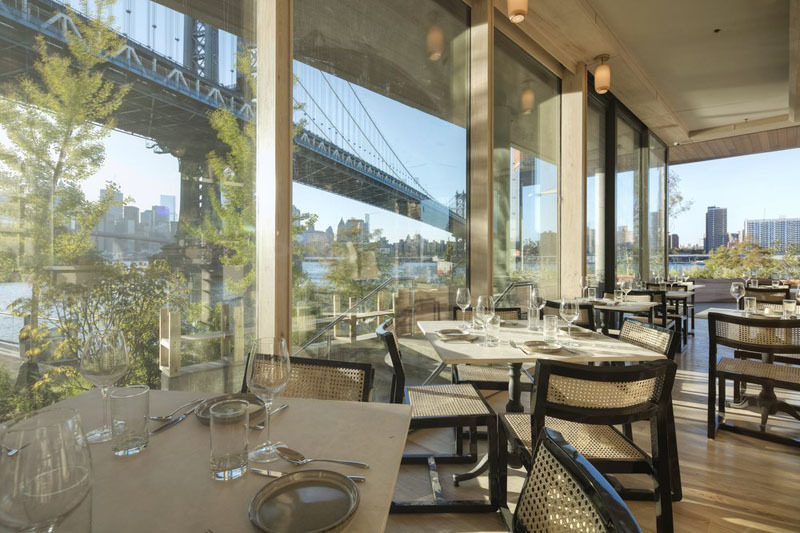 Celestine is an elegant, breezy haven for delicious Mediterranean fare on the water in Dumbo away from the maddening crowds. Killer views of the Brooklyn Bridge and Manhattan provide major wow factor. Celestine hosts both group bookings and private events. 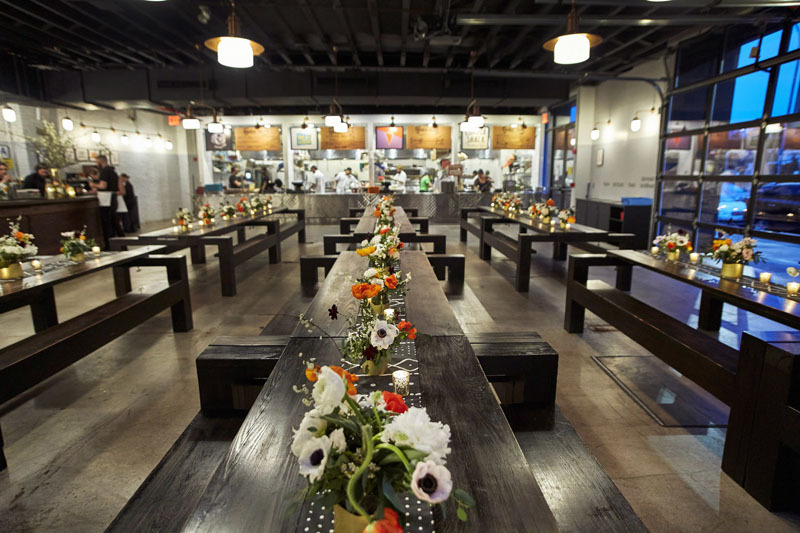 This Brooklyn event space is the perfect venue when seeking graduation venues near me in Brooklyn, or for small weddings, rehearsal dinners, bridal and baby showers, corporate events and meetings, birthdays, anniversaries, and bar and bat mitzvahs. Full restaurant buy-outs: Up to 84 seated and 100+ standing. Alexandra Partow Events is a Brooklyn-based firm specializing in bespoke social and nonprofit events. Contact by email: alexandra@partowevents.com. Follow on Instagram: @partowevents and like on FB @partowevents.